China in Africa: The Real Story: "Germany blames Chinese land buys for Africa drought": Really? "Germany blames Chinese land buys for Africa drought": Really? Today here at the International Food Policy Research Institute in Washington, DC, I spoke by phone with a German reporter who wanted to interview someone about the statement this morning by the German government's Africa adviser Guenter Nooke who allegedly blamed Chinese land buys for the drought in the Horn of Africa. "While China is active in the mining and infrastructure development sectors, they were surprisingly absent from land investment deals. Recent evidence suggests that a Chinese company is poised* to sign a 25,000 ha concession to produce sugarcane in the Gambella region, and this company claimed to be the first agricultural company from China (emphasis added)." "A common external perception is that China is supporting Chinese enterprises to acquire land abroad as part of a national food security strategy. Yet the evidence for this is highly questionable." So who has actually invested in Ethiopia? Well, the real story seems to be that it is Western hedge funds, among others. Here's Mittal's YouTube interview. * Oakland Institute has a copy of a contract between the Ethiopian Ministry of Agriculture and a Chinese company signed December 12, 2010. Nothing appears to have come of this yet, but this could change. If any of you are following this issue in Ethiopia, let us know what happens. Excellent post. I'm also reading a litany of news lately about this topic and am finding myself equally infuriated. Not only is pointing the proverbial finger at China becoming more popular, but the more finger-pointing that's being done, the further away from the root of global food problems we are becoming; namely, consumption patterns set by western countries. Land-right disputes between powerful organizations and farmers have long been a tragic problem and should absolutely be addressed by the international community. But this finger-pointing is doing little more than taking attention away from the real problems at hand and should be put to rest. The Ethiopian Minister of Agriculture and Rural Development recently released the Land Rent Contractual Agreements for land leases between the Federal Democratic Republic of Ethiopia (FDRE) and twenty-four companies or individuals. Huan Dafengyuan Agriculture Co., Ltd. Is one of those 24. “Not everything the Chinese are doing in Africa is bad," Nooke said. "Chinese investment has perhaps an advantage: it will show how industrial farming in Africa can be carried out effectively." He said that Germany supported a gradual phase-out of European agriculture subsidies so African farmers could have a shot at exporting their produce but admitted that there was still strong resistance. DW today reported that AFP received a document from Chinese Ministry of Foreign Affairs, China declines Guenter Nooke's charge and states that China has never had a plan to acquire foreign land. It only has 10 agriculture demonstration projects. Also seen: it shows a remarkable lack of realism! To have or have not…. I absolutely agree with what Anuradha Mittal said in that interview. Yet I also agree with the quote you cite form Nooke. And you also joins in on it, it seems to me (except with his assessment of China's role in it). So over the merits of the case itself, we agree. I further understand that it is annoying to see China often used in the West as a factor in noble campaigns to mobilize more people more effectively. A bit like people used the scarecrow of "communism" in the past. But in substance this is not so wrong: as Nobel laureate Amarthya Sen said: countries like China and India (more than 1/3rd of the worldpopulation) can not suddenly join the globalization (and their people aiming to pursue "the American way of life ") without major consequences for the rest of the world. or hedge funds were directly investing in assets in the country”. Similarly, on the one hand, I see that China has become the worldprice setter for many agricultural products and on the other side I also know that China Inc. currently has limited presence in Ethiopian agriculture. But who will benefit the most in Ethiopia is of secondary order, nevertheless here I want to stress that China, as part of its "Going Global" strategy, has plans for all that. And these are in line with the better known “within 5 years, 50% of "our" iron ore must be supplied by "Chinese" companies. China always denied it harbours any intentions of replicating the West’s colonial expansion in Africa. But earlier this year, delegates to the annual session of China’s parliament debated a proposal to seek employment for up to 100 million Chinese in various African countries. The proposal was put forward by delegate Zhao Zhihai, a researcher with the Zhangjiakou Academy of Agricultural Sciences in China’s breadbasket province of Hebei. Zhao, who had visited Ethiopia and Guinea to explore possibilities for agricultural cooperation in cultivating hybrid rice on the continent, told delegates that Africa’s vast land and underdeveloped agriculture could provide employment for up to 100 million Chinese labourers. "In the current economic climate, with so many of our people unemployed, China can benefit from finding jobs for them and Africa can benefit from our expertise in developing any type of land and crop," Zhao told the parliament. He suggested Beijing should draft a long-term strategy of dispatching Chinese labourers to Africa in order to solve two of China’s greatest challenges—food security and unemployment. China, for example, who is currently the largest investor in Ethiopia, wants to produce sesame. China has been Ethiopia’s largest market for sesame export. China uses sesame for chocolates, biscuits, and extraction of oil for both its external and domestic markets. If China is to satisfy its enormous needs for oilseeds through its own production of sesame in Ethiopia, this would certainly put Ethiopia on a disadvantaged position. China in this case turns out to be both a supplier and a consumer in which case it can even do away with additional supply of sesame by the Ethiopian traditional producers. This fact would inevitably harm local sesame producers by imposing on them a lesser competitive advantage in terms of market price. Local Ethiopian farmers can in no way compete against the large scale agricultural farms in setting the market price, quality standard and terms of trade as they are weaker in know how and use of technology. Secondly, abundant productivity by the mechanised farming would immediately mean lower price for the production under question though tax and cost of production may remain the same for individual peasants. The expected advantage in employment and technology transfer may also not be realisable as China often uses its own employees. All these arguments hold more or less true as far as other investing countries, like India and Arab countries, are concerned. This shows that the humanitarian consequences of the kind of foreign investment under discussion are far reaching, indeed. It uproots the peasants from their land, which is not only the source of their social identity but also their means of earning life. In doing so it may even turn the self employed to unemployed bulk of people with no means of livelihood. This is not to mention the destruction it would certainly entail in respect to environment and the ecological balance in general. For example, drinking water may get even scarcer in the face of irrigation necessities or deforestation that could result from the aggressive and irresponsible nature of foreign mechanised farming. As this is endemic to the entire social fabric, the current government campaign for land grabbing by foreigners is not less than what one might be tempted to call “global agrarian colonialism”. The Ethiopian government now offers more than 3 million hectares of agricultural land to foreign investors. Very wealthy people will, by ensuring that many more less wealthy people will have acces to their daily steak, become filthy rich. With them, the appointment is already beeing made today, at best on the beaches of the European Mediterranean coast, or else in the afterlife! Kudos to what by some insiders is called “Food Piracy”! But what do you propose to develop agriculture on the African continent? In Australia there's some conspiracy theories like this as well... not linked to the Somalia drought/famine, but more to do with concern that Australia is going to be bought up as some kind of food bowl for China where Australian ownership of agricultural land and water allocations will be 'taken over' by Chinese companies and then all of a sudden Vegemite sandwiches will cost $400 each and we will all die out, or something. Chinese firms are acquiring some agricultural land here when it goes up for sale, that it true... but firms from the Middle East have actually been bigger buyers. But with the way it has been reported here, Chinese "interest" in buying agricultural land is the concern and the media hypes it up... while Middle East investors actually buy the land and that is barely covered. The high cost of agricultural labourers in Australia has been one of the issues here with farm profitability (as well as drought), so it will be interesting how this progresses. Foreign firms are unlikely to be able to get around Australia's industrial relations and labour laws to enhance profitability and now some in parliament are also proposing regulation on foreign agricultural land purchases and foreign purchases of water allocations (irrigation water in Australia is rationed through a permit system). Since a few years after my marriage, nearly half a century ago, I have no illusions that I ever could provide solutions. And whether I am good or bad, elected or not, I would do everything possible to stay friends with those farmers. Finally, I would convince him that, if no results come, he no longer will be there(as Minister of Agriculture). From here it is up to others to take it over…. It escapes me what exactly is meant by "conspiracy theories like this." I thought that now the new Australian government policy discouraging China to buy up farms, but stimulating it to invest in the agribusiness, was in the Australian news? Ever heard of a Belgian company? Well, I live in Belgium, a country with one of the most open economies in the world. But if you have a Philps share in hands, then take a good look. You will find that you have no contractual right to the industrial company Philps, but only in a fiduciary who promises that you will receive any economic gains of the industrial company.Gone are your voting rights! For over a century my neighbor country The Netherlands uses an intelligent protectionist economic policy and you kown the names of its companies! This in itself is already a risky business, and thereby depending on one main customer is a dangerous thing in the square! And the link with Africa is simply not there. In Australia, there is a political debate about all this, it is a great and powerful country and the government watches over the interests of its citizens and has a state machine to ensure that the democraticaly chosen policy in this area is respected by all parties. Unfortunately, Africa is just the antithesis of that. No conspiracy theory in all that, from the viewpoint of Kabila this is pure logic! Ashlee, thanks for your thoughtful post. People I spoke to in Canberra had a pretty realistic idea of the degree of actual Chinese investment and were also struck by the media coverage, and the parliament's reaction to that. We've had similar bouts of that here. Recently the Millennium Challenge Corporation decided to forbid any state-owned companies (read: Chinese) from getting contracts to build infrastructure MCC is funding in African countries. So our low income MCC friends will now have to turn to German contractors? Concerning Guenter Nooke's charge that China is to be held responsible for the current drought in some parts of Africa, one can read the article by CHENG Guang-jin, entitled ''China to give $ 14 million in aid to Africa,'' on chinadaily.com.cn 2011-08-05. This article deals with the wider issue of the current situation in Ethiopia, Kenya etc. and the UN urge for solidarity with these countries. This is a response to Nancy Pelosi calling on China for more help for Somalia. The Chinese foreign ministry said it had supplied 90 million yuan ($14 million) worth of food aid in response to the crisis. "The central government pays close attention to the large-scale famine caused by a devastating drought in the Horn of Africa and expresses sympathy to people in stricken areas," a ministry statement said. You and I know that the U.S. want to score points here and they do! To compare: this global amount of help is slightly less than what the USAID paid to the Somalian World Food Program as transportation costs for the 65.000 MT of food donated by the Brazilian govrnement. This Pelosi's call on China to bring more help to Somalia is but a provocative move on this hysterical lady's part. We are all aware that she leaves not a stone unturned to harass China whenever possible. China's economy is just emerging since the years 2000s (as Han Suyin predicted in her book written in the 1960s) but it tried to do its best to help our African friends to develop their national economies since the 1960s. So, it seems a litle irrelevant to me to compare China's current contribution to Africa's development with that of the USA. Let's just wait and see. Today Deutsch Welle has another article in Chinese regarding this topic. It claims China will acquire 2.8 million hector farmland field in DR Congo to build world largest 油棕榈 (Elaeis?) plantation. Wei, I looked into this allegation (see my post at http://www.chinaafricarealstory.com/2010/03/china-and-african-land-grab-drc-oil.html)the discussion was real (it was an oil palm plantation, although probably not as large as reported above). It was not "China" but ZTE Agribusiness Corporation that was involved in this discussion. The last I heard of it (an interview in Beijing last fall), ZTE had done a pilot study on 250 hectares and determined that with high transport costs the project would not be economically viable. But unlike most of the stories floating around, this one was backed by a real contract/MOU. Thanks professor. Today Chinese media CaiJing (caijin.com.cn) reported China Foreign Ministry diplomat responsible for African affair Lu ShaYe openly denied western media's allegation on China's land grab in Africa. The article has some details on China's involvement in African Agriculture sector. I guess by conspiracy theory I meant the kind of hyped fear in the media (and that being expressed by some parliamentarians as well) that China is the only foreign buyer of agricultural land that we need to be concerned about and that they are going to starve us out or something. I agree with you that foreign ownership of agricultural land is an important issue, particularly given greater concerns about food security in the Asia-Pacific, however a rational approach needs to be taken. On actual sales, Middle Eastern countries have been a bigger purchaser of agricultural land in Australia to date rather than China, so the current fear-mongering is rather over the top. We should instead be assessing the issue of agricultural land purchases and water purchases by foreign entities in a more level headed manner and through a broader policy framework. Given the decline of rural farming communities as more and more Australians gravitate to urban areas, the profitability and labour force challenges of the agricultural sector, and the future complications of climate change adaptation, we need to look at it this issue through a broader lens. i.e. What needs to be done to ensure the future viability of the Australian agriculture sector? Will foreign investment help? 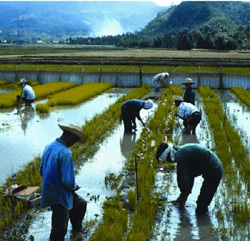 How can we address agricultural labour supply issues? Do we need a regulatory framework around these kinds of issues to ensure sustainable practices? etc. I agree with everything you cite above, only I put this in a broader context. Indeed, in the Australian press, I see sometimes outbursts of China bashing and / or anti-Chinese racism. I’ve also read that the "Middle East" is now a bigger investor in Australian farmland than "China". But here you put two very different levels together. Saudi Arabia has twice as many inhabitants as Belgium and Quatar 10 times less than Belgium. Both countries are several hundred times wealthier than Belgium, and will, as a global food shortage occurs, be the last countries that are affected. The purchase of agricultural land in Australia has therefore nothing to do with food security for their own people but every thing with a global land grab that is not dominated by countries, but predominately by investment companies. Professor Brautigam has recently illustrated this here for Africa, but it's a worldwide phenomenon. Underexposed is how Western agrobusinesses and financial groups more and more gain a firm foothold in China. Goldman Sachs as a pig farmer in China is a reality since years. Both in Australië/New Zealand and in Africa, the Chinese companies do not play the lead role, because there is strong political opposition in the first two countries, and because in Africa (and worldwide) it is very sensitive to export agricultural products from Africa. China's and India's responsibility in this issue is on a whole different level. I support Nobelprice winner Amartya Sen, who says that you can not suddenly inject 2.5 billion people in the worldwide globalization and let them pursue an "American way of life" whithout consequences. This population pressure, and the nutritional needs associated with it, is of an unseen magnitude; e.g. it represents 250 million times more people than there are Belgians, or 125 million times more than there are Saudiarabians! Whether white, black or yellow, rich people know this and will, through those investments, become rich as never seen before. Similarly, we already know who will be the hundreds of thousands of victims and that will be deadly victims! Today Radio France International Chinese edition website has an article regarding Guenther Nooke's previous accusation against China, it says that Guenther Nooke denies he had said China is responsible for Africa's drought. It also says Nook has issued a letter to Chinese embassy in Berlin to apologize the misleading report for his words. I wonder, why do these articles seem only to be published in the Chinese edition? I'm also seeing this with Deutches-Welle, interesting Chinese articles on this topic (including an interview with me :), but nothing in their English edition! "What we saw is children who are arriving so weak that many of them are in stage four malnutrition and have little chance - less than 40 per cent chance - of making it," Sheeran said. "We also heard from women who had to leave babies along the road and make the horrifying choice of saving the stronger for the weaker or those who had children die in their arms." The International Red Cross has delivered 400 tonnes of food to drought affected areas of southern Somalia, controlled by al- Shabab fighters. But the WFP says it is still being blocked from rebel-held areas and it will begin airlifting food aid into Mogadishu, which is controlled by the country's Transitional Federal Government, on Tuesday. Many famine victims continue to travel between Somalia and Kenya seeking food and shelter - walking along a road that French Minister Bruno Le Maire has described as "a road of hope, but also a road of death". Where can i find more updated news about this subject? Do you know if this land grabbing trend is also happening in latin america?